We have owned 4 cockatiels, 2 parakeets, and several fish over the past few years. Although we love those pets, there was something missing. We pondered adopting a dog many times, but did not do so because we were afraid of the dog attacking the birds (they are open cage birds). A former student from South Miami Senior High School named Jackie sent us postcards on each major holiday with her pugs in costume. One day we decided go visit Jackie. 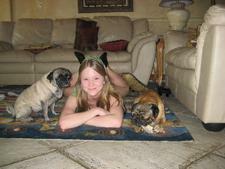 When we arrived, we were greeted by three pugs, Bailey, Riley, and Bodie. We fell in love with all of them and came home to research the rescue sites. Then we found Marcia’s site. We applied to foster a pug, and luckily, Ruby was available to foster. Sweet Ruby moved in and is so gentle with all the other pets and us!!! She gave us her complete love and attention. We felt she might want a little companionship when we are away sometimes, and then came along Pugsley into Compassionate Pug Rescue. We picked him up from the vet that neurtered him and he moved in. He wasn’t too happy and very standoffish about the whole situation. He refused our hugs for several days, but then little by little, he wanted to sit beside us on the rug. He started accepting a little hug here and there, and now he loves being hugged. He loves playing with the neighborhood children in the backyard. He even likes to play sometimes with the old beanie babies. He and Ruby are wonderful companions and we are even planning in the near future for a small pug meetup in South Miami/Coconut Grove area.